The era of directly observing interstellar space has begun, and astronomers are just starting to put together the puzzle from Voyager 1 to form a more complete picture of what’s happening beyond the solar system. Initially, astronomers predicted that Voyager would detect a stable magnetic field outside the heliosphere (an older artist’s concept, right, showing Voyager 1 at the top, and stable magnetic field lines in black), but instead, it’s been passing through a field that’s slowly turning. 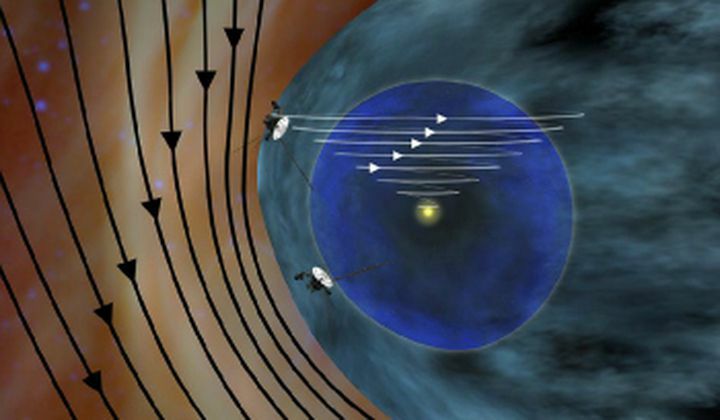 By combining Voyager data with that from NASA’s Interstellar Boundary Explorer (IBEX), which launched in 2009 and observes from a geocentric orbit, astronomers believe that at the interstellar boundary, solar wind is still distorting the magnetic field. By 2025, Voyager should pass beyond this distortion; unfortunately, the spacecraft will begin shutting down its science instruments due to lack of power around 2020.